Utilities Employees Credit Union has selected the winners of its 2013 Student Scholarship Contest for students who are family members of workers in the energy or utility industries and students pursuing employment in energy-related fields. UECU is awarding $1,000 scholarships to students with a family or academic connection to the energy or utility industry. Utilities Employees Credit Union (UECU), the billion dollar virtual credit union serving the U.S. utility and energy sector, has selected the winners of its 2013 Student Scholarship Contest. Winners Miranda S. and Jenalee S., both of Pennsylvania, entered essay submissions presenting the benefits of credit union membership to utility and energy industry workers and their family members. Each will be awarded a $1,000 education award in the annual UECU Student Scholarship program for students who are the family members of workers in a utility or energy industry, or are themselves pursuing employment in energy-related fields. Each year, the organization announces a new theme for entries to the UECU Student Scholarship Contest, which is open to UECU members who are about to enter or are currently attending college or advanced training at an accredited institution. For the 2013 contest, student members were invited to submit a short essay or video sharing the benefits of UECU membership with workers and families in the utilities industry. This year, credit union members and the family and friends of contestants were also given the opportunity to vote for an additional “People’s Choice” winner, who will receive a bonus prize of a gift card for textbook purchases, in a contest taking place on UECU’s Facebook page, through the end of May. 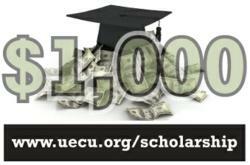 Year-round contest information and annual submission guidelines for the scholarship contest are provided on UECU’s scholarship program webpage at http://www.uecu.org/scholarship.